Baldwin, R E (ed) (2009), The great trade collapse: Causes, consequences and prospects, a VoxEU.org eBook. 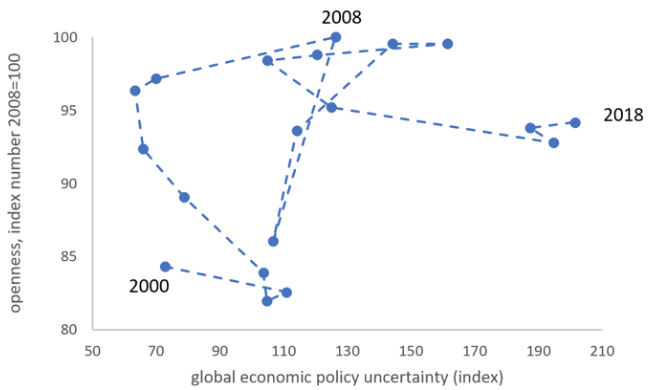 Davis, S J (2016), “An Index of Global Economic Policy Uncertainty,” Macroeconomic Review, October (updated on http://www.policyuncertainty.com). Hoekman, B (ed) (2015), The global trade slowdown: A new normal, a VoxEU.org eBook. 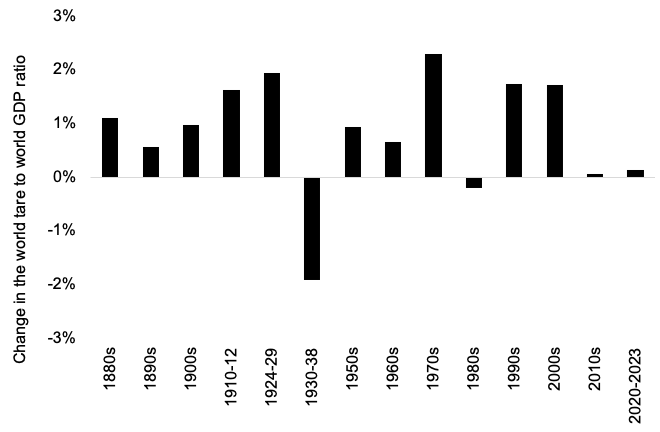 Maddison, A (1995), Monitoring the World Economy 1820-1992, OECD. Maddison, A (2001), The World Economy: A Millennial Perspective, OECD. O'Rourke, K H (2018), "Economic history and contemporary challenges to globalization," CEPR Discussion Paper 13377. O'Rourke, K H (2019), “The end of globalization”, Vox Talks, 1 February. Pástor, L and P Veronesi (2018), “Inequality Aversion, Populism, and the Backlash Against Globalization", CEPR Discussion Paper 13107.
van Bergeijk, P A G (2018), "On the brink of deglobalization… again", Cambridge Journal of Regions, Economy and Society 11(1): 59-72.
van Bergeijk, P A G (2019), Deglobalization 2.0: Trade and openness during the Great Depression and the Great Recession, Edward Elgar. The figure is intended to sketch a long-run perspective and thus by necessity focuses on merchandise trade in relation to world production. This of course ignores developments in services and financial flows.